Styled with charley peak hat , dexter pant and chalmers sweater . 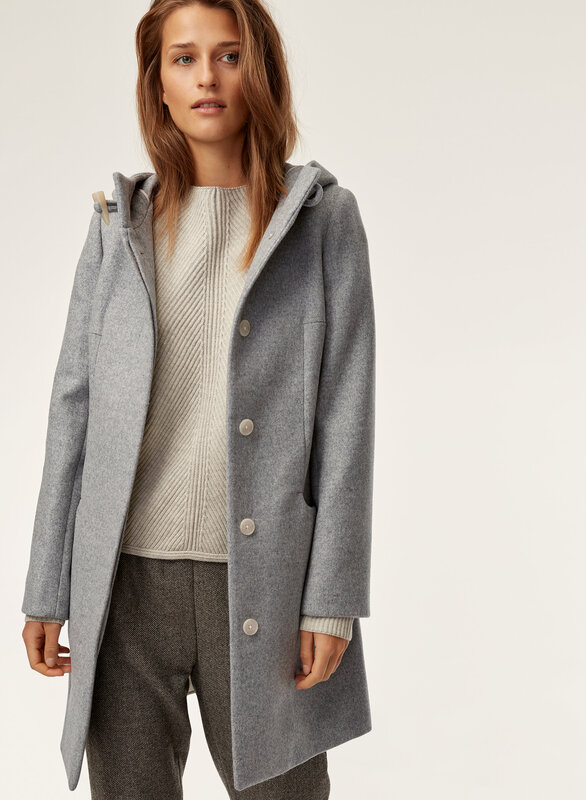 This architectural coat is made with a warm wool-cashmere blend from an Italian mill renowned for its luxurious fabrics. Contoured seams lend structural balance to the plush, heavyweight feel. nice to fit my body shape.nice colour. fits me very well，very comfortable. It’s true size but longer for me.. if it’s short a bit. Look very nice! Good fit, nice material, nice cutting, light weight, love it! 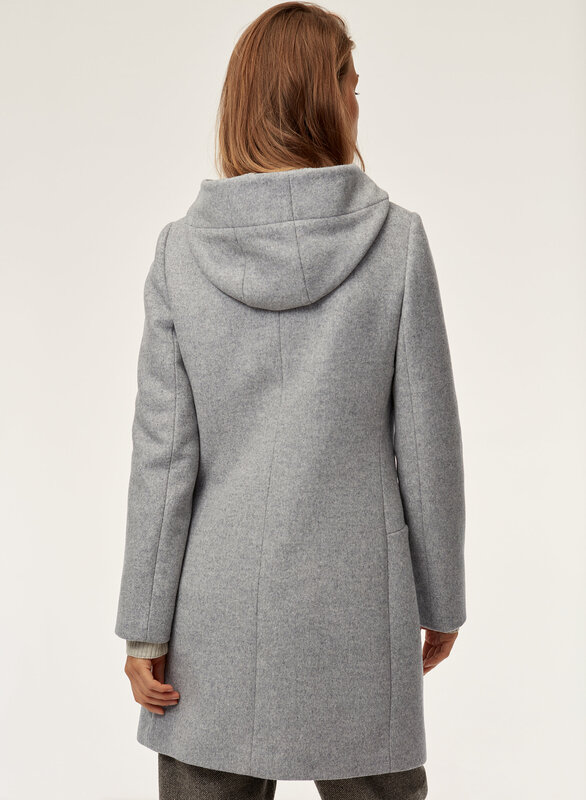 I ordered this coat online in a size S (which is my usual size, but sometimes I am a M in coats and jackets). It fits slightly larger than I expected, even with layers and thicker sweaters underneath. It is a beautiful coat and very warm, do not regret this purchase. My one issue is the label that was on the outside of the left sleeve- I cut this off very carefully and gently. Even without pulling at the thread or doing it carelessly, there are pretty big holes where the label was. It is right on the outside of the sleeve and very noticeable, making it look lower quality than it actually is. I have never had this problem before with any other coats, from Aritzia or not. I will probably not order another coat like this from Aritzia again. The fit is great, the material is warm and the colour is pretty ( navy blue). The small size fit well but the only thing is that the sleeves feels big and baggy. But other than that. It is good! The color is beautiful and the fit is true to size. I am usually a small and purchased a medium that was too big for me. I had to return and get a small size and it fits perfect! I love the style and flitted silhouette. Cannot wait to buy more colours. This coat is deceiving, it looks like it wouldn't be that warm when in fact it is. I bought it for the style and I am so impressed with the warmth it provides and how soft the fabric is. The price is bit much but this coat is going to last a long time. The only thing I wasn't a fan of was taking the tag off of the sleeve so that it wouldn't wreck the fabric. This coat is close to perfect for me. I am 5’9”, 130 lbs with broad shoulders. I bought a size small. The sleeves are long enough, the pockets are huge, and the coat is warm and cozy. It fits as shown in the pictures. I love it. I like the cut shape, it’s my size. I don’t like the buttons, and button space is too big. As the winter coat is not keep warm enough. Warm, fashionable, functional and such high quality. Was trying on this coat at the store and the small was really big and the xs was slightly tight on me and the sales person walked by and asked to help, she wasn’t sure why the size was so off and told me to try on a few smalls and surely enough the other small fit. She concluded that some of the smalls were mislabeled and were actually medium. It fits really well and is warm. This is my favorite coat of the season! Fits perfectly, stylish, warm and feels soft. Hood gives the coat a not-too-serious vibe. Good day-to-night coat. Not super warm. It’s very comfortable and I love the hood. Not the warmest coat I own but definitely does the job. Nice that it has room for a sweater and scarf underneath. I intend on layering with this coat so sized up to a medium. Fits well. Looks as pictures. 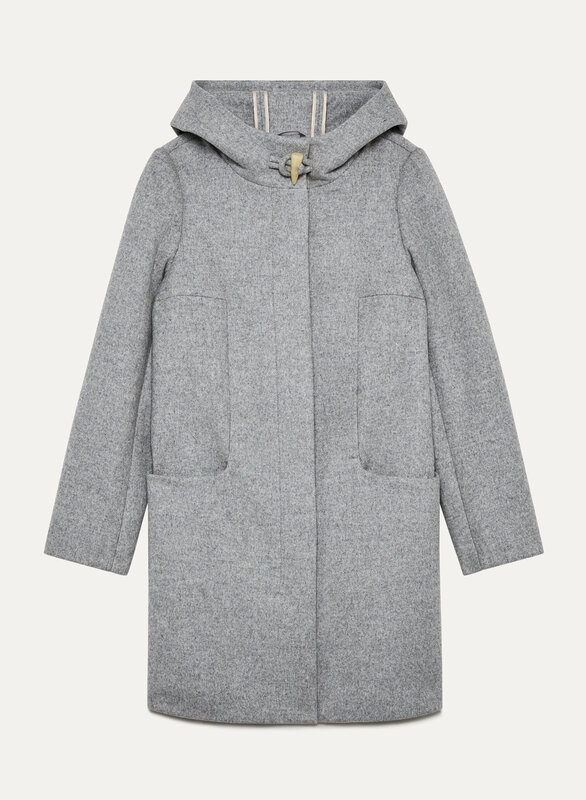 Love the deep pockets and the hood, which are hard to find in wool coats. Love it. Fits well and close to the body. Nice thick material that keeps you warm. Love this coat. The fabric feels really nice. The styling is classic. Fits pretty well. Thought that the sleeves were a tad too long but once you get those elbow creases, it fits just right. Really happy with my purchase. I love the look of the coat. It's perfect for looking professional and being comfy at the same time. I bought this coat about 2 years ago when I moved from Los Angeles to a colder climate. Everything about this coat is beautiful. Big pockets. Great length. Awesome hood. I get compliments every time I wear it. Unfortunately the fatal flaw is the quality. I bought the coat in the Heather Comet color, which is beautiful. Last winter I noticed that the edges of the coat looked very dark, particular at the end of the sleeves. I thought I had somehow gotten it dirty and asked my dry cleaner to fix it up. He pointed out to me that it was not dirt, but actually from wear. As the coat wears, the lighter wool/cashmere on the outside is rubbing off and exposing a black fabric underneath. This winter it has gotten much worse and the darker fabric is showing through all over. I'm devastated because I love this coat and was hoping to wear it for many years. I don't think this would be a problem with the charcoal grey and black colors, but it definitely is for the lighter colors. Sad face. Absolutely love this coat in the Camel colour. I have received many compliments on it and very happy I ordered it. 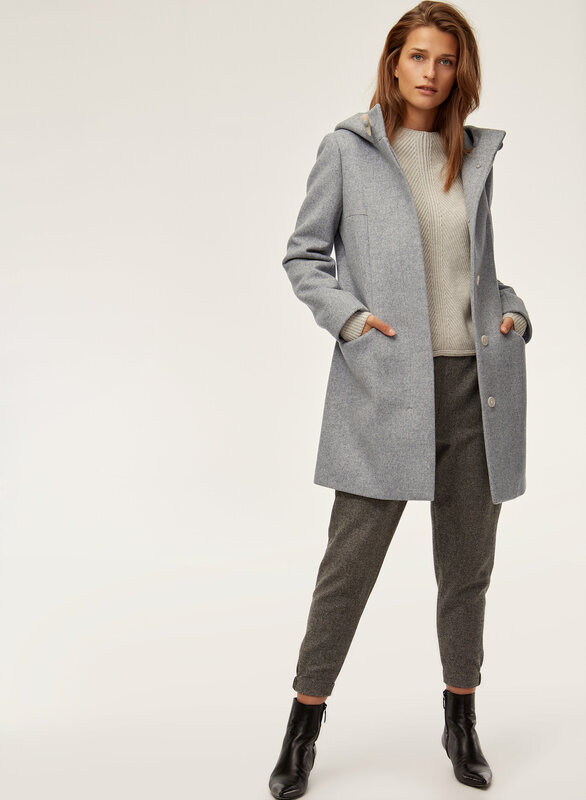 Aritzia coats do not disappoint and the Pearce is definitely a great value overall. Although I ordered my normal size I have had friends who are wider in the hips mention that this coat fits quite narrow throughout. I am 5"4 and this coat is the perfect length. 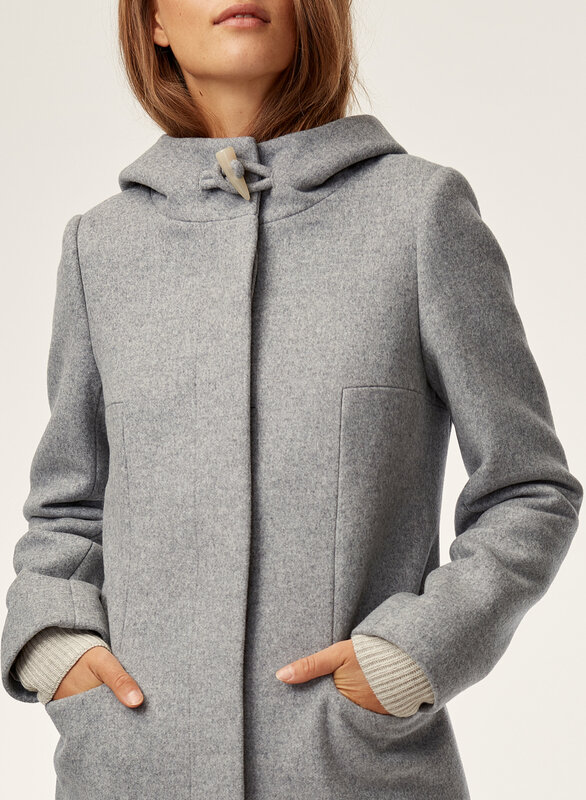 I also love the versatility of a wool coat with a hood. I have gotten stuck in the rain a few times wearing this and the water dries perfectly off of it and the hood kept me dry. I also have this coat in black. I loved it so much I bought it in the red, too! I was disappointed to have had a tear under the arm within the first few times of wearing it, but Aritzia was fantastic in their customer service and had it complementary repaired for me. A class act! I am usually a small/medium in aritzia clothes, depending on the brand and style. Coat is very warm and stylish. Would def recommend ! I have this coat from years ago and it was a very thick warm coat. The material was so soft. I decided to purchase a different color. The material list is exactly the same but it is not the same quality. The coat is thin and feels itchy. For a nearly $400 coat I would look somewhere else. Amazing quality like always and the fit was great but had to return because I was looking for something a bit more structured. The material was too soft and I was looking for a "sharper" look. Wearing it at -10C ! I love this jacket so much, so sleek and warm, great to wear during Fall and Winter. I can wear inner layer to ensure warmth. Love the deep pockets to put my bulky phone. The colour is a bit darker red than whats shown online, which for me ended up being even better! The fit, the style and the look is great and I love the hood. I’ve already received many compliments. Fits true to size — it’s a gorgeous coat. The quality seems great, the fit is great and the wool isn’t itchy. Only gave it 4 stars though because it’s so expensive. I love this coat, I currently own it in 2 colours. It's very beautiful and luxurious, and the hood keeps your ears warm in the winter. It falls mid thigh in length. Absolutely love this coat. I’ve gotten numerous compliments while wearing it. The quality is amazing and the wool cashmere blend is honestly, the best. I wouldn’t hesitate to order this coat or other coats on the site if this is the standard of quality. I got the x-small, and it's the perfect length for my legs and arms (I'm 5 feet for reference). It's also perfect for frigid Ohio winters. Love it. Beautiful Coat- Good quality but I found it fits a litter bigger than expected. I like the grey with white buttons, I wish it has petite option, I bought size s, but the arm is a little long. The material is wool blend, not 100% wool, so it's a little pricy. Love this coat. It's warm and fits perfectly.